We buy fixer uppers, rehabs and junkers too! 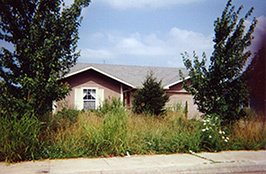 Okay, we are sure that this one is probably much uglier than yours, but even if this "was" your house, we could help! Don't worry about making repairs on your house because we may very well save you the headache and the expense of repairs and take your house exactly as it is. From minor repairs to major rehabs we would love to make you an offer! CALL US NOW!